In these lectures it is explained how the theory of nonequilibrium thermodynamics may be used to model dynamic phenomena at a fluid-fluid interface. Use is made of the concept of excess densities and currents introduced originally by Gibbs (1906) to describe the equilibrium properties of such a system. An explicit expression for the entropy production is given. Onsager relations are discussed. 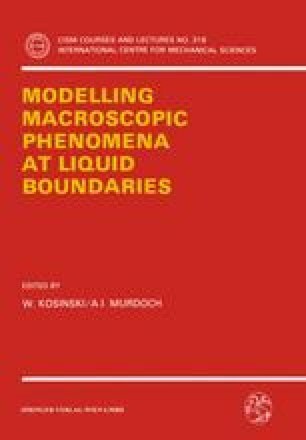 Furthermore it is shown how capillary waves give contributions to the equilibrium correlation functions of the system in the neighbourhood of the interface which have a new and unexpected behaviour. Finally fluctuating “forces” are introduced in the constitutive relations which make a calculation of the time dependence of the correlation functions possible. Fluctuation-dissipation theorems for these fluctuating forces are given.